At Kelowna Yarn & Needlecrafts we offer a range of workshops through our innovative, building block-style curriculum. All our workshops are taught by experienced crafts people who love sharing their passion, knowledge and experience with students. Most workshops are capped at 6 participants in each session to ensure you get the attention you require to gain confidence and enjoy your learning experience in our relaxed setting. Registration is on a first come, first served basis. You can register online (just click on the workshop you're interested in), in person at the shop, or call us at 250-860-8801. Register now to secure your spot! Create a cuddly sheep while learning needle felting techniques. Learn to dye unique skeins of yarn in your crockpot. Discover how to naturally dye silk using the ecoprint method. Our learn to knit class is perfect for those new to knitting or needing a refresher. Dye yarn like a pro using a mason jar and the sun. Speed up your sock knitting by learning how to do 2 at a time. Learn to dye your own yarn like a pro in this Yarn Okanagan festival workshop. This Yarn Okanagan festival workshop will share techniques to knit a colourwork yoked sweater. This Yarn Okanagan festival workshop offers an introduction to bias knitting in shawl design. Learn to play with warp and weft in this Yarn Okanagan festival workshop on tapestry weaving. 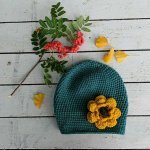 Learn the basics of crochet while making a cute and cozy hat. Please note registration is on a first come, first serve basis. Payment of fees is required with registration. Workshop fees are non-refundable. If the workshop is cancelled by Kelowna Yarn & Needlecrafts or the instructor, attempts will be made to re-schedule or a credit for a future workshop registration will be issued. Make up sessions for students will be at the discretion of the instructor. Workshop supply lists and homework are posted with each class. Please come to class with your homework completed (usually a gauge swatch) to ensure you are able to get the most out of your time with the instructor.